Last Thursday, Harvard celebrated a “historic moment”—University students, faculty, staff, and HUDS workers (bless them) endured the snowiest Boston winter on record—with s’mores and hot chocolate. 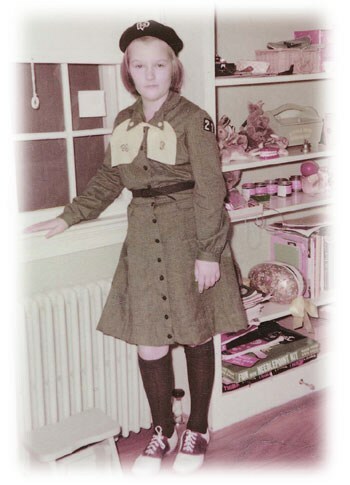 Drew Faust in her girl scout days! Never failing to miss an opportunity to eat free s’mores (read: any food whatsoever), I headed to the Science Center per an invitation from University President Drew Faust emailed to the entire Harvard community. While enjoying my “well-deserved hot chocolate,” I carefully turned my marshmallows over wind-whipped flames to achieve a perfect golden brown and pondered: how does Harvard’s leader like her s’mores? Though Drew Faust admitted she did not attend this celebration of spring’s calendar arrival (we all know it may be months before we say a final goodbye to melted mounds of sullied snow), she gave Flyby the exclusive on her s’mores preferences. To accompany her crisp, black marshmallow between sweet squares of graham crackers, Faust prefers dark chocolate. “I always like dark chocolate better than milk,” she said. Faust, who could not recall the last time she enjoyed a s’more, said she remembered the campfire delicacy from her girl scout days. And we found it—the 1950s were certainly good to the University’s president. The Crimson’s central administration reporters reserve the final question in their monthly interview with Drew Faust for Flyby. Please email mariel.klein@thecrimson.com to make a suggestion.